Mac and Cheese is a kid favorite, and an indulgence for many of us grown-ups too. 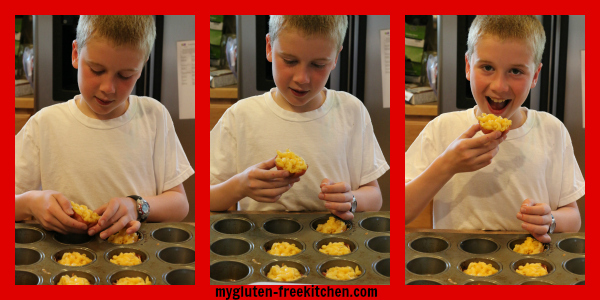 Today, I’m sharing a fun mac and cheese recipe that you and your kids will love. For this recipe, I recommend gluten-free mac and cheese from Trader Joe’s or Annies gluten free mac and cheese. I wanted to use the gluten-free macaroni and white cheddar cheese to create a meal that the kids could help make for an easy lunch. While I was brainstorming one day (okay, okay, in the shower, if you must know – that’s where I get all my recipe ideas), I had the idea to line a muffin pan with ham slices, fill with the cooked mac and cheese, top with extra cheese, then bake a bit. I was thinking this would be a fun meal for lunch at home or to put in my boys’ lunches for school. We enjoyed them with sides of green beans and fresh fruit salad, both of which my boys could help prepare. Honestly, I think after another practice run, this is a meal my kids could do start to finish by themselves while I kick back and relax nearby! With the recipe taking only 30 minutes start to finish, this is a great weeknight meal! Note: I also froze a few and they were great reheated also. 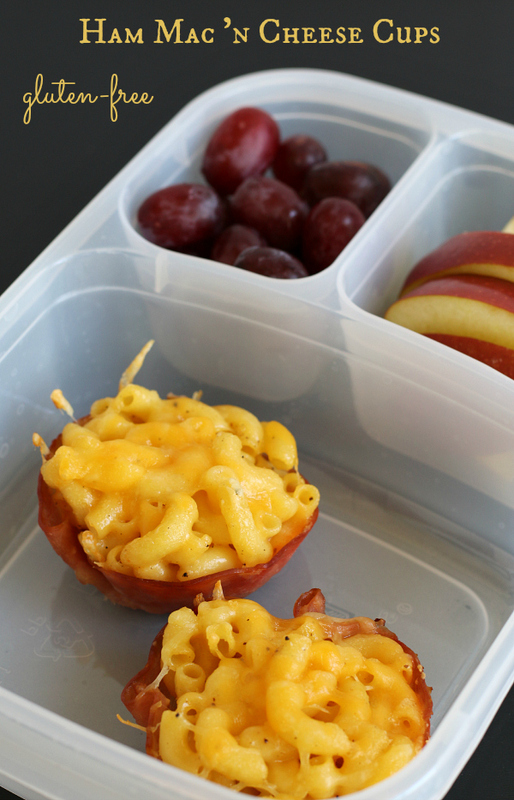 This makes them a great option for making ahead, freezing, and sending in school lunches. Easy, 30 minute dinner that the kids can help make! These freeze and reheat well too! While macaroni is cooking, spray 10 cavities of a metal muffin tin. Line each cavity with a slice of deli ham. Drain macaroni in colander/strainer, then put back in pot. Add sauce/packet according to package directions. Add black pepper and garlic powder and stir until combined. 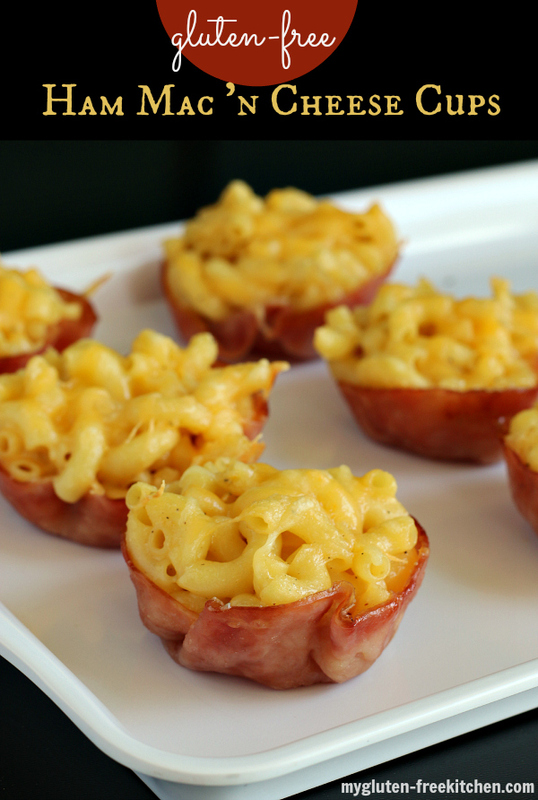 Fill each ham cup with mac and cheese mixture until full. Top each with a sprinkle of the shredded cheddar. Bake at 350° for 10-15 minutes or until ham is firm but not burnt and cheese is melted. Let cool in muffin pan until you can remove from pan easily. Serve immediately or let cool and put in freezer bag for later use. How fun! The kids are going to love this! What a great idea! Love that they are good for lunch kits too! These are absolutely adorable and, really, you can’t beat anything in “mini” form.